Happy Summer, SPNers! What a strange spring season it was—but it appears summer has kicked into high gear for June. 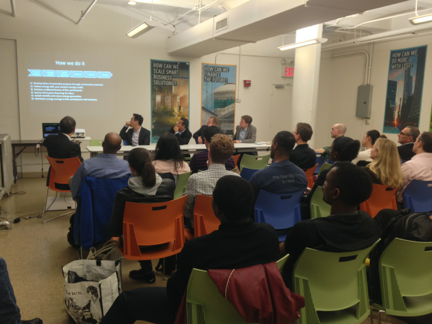 In April we convened a great panel to discuss big data and its relevance to sustainable development. It was frankly stunning to learn of the progress that has been made and the brave new world of data research that is before us. If you missed it, our good friends at NYU Stern recorded it here. Have a great summer! We will be back soon with a robust fall schedule of events. Read more about Happy Summer! Happy New Year members and friends of SPN! It’s been a little while since our last update, but needless to say it has been a busy season for SPN and in the climate space particularly. As I write, the world celebrates the global climate deal that took shape at the UN COP21 in Paris. The world has committed itself to no more than a 1.5ºC temperature rise, a feat thought impossible not long ago. This will require recalibrating plans in 2018, 2020, and so on, as current plans don’t actually hold to this target. Nevertheless, this is progress! Congratulations to everyone who worked so hard to reach this historic agreement. While a deep-dive into the intricacies of the deal is still forthcoming, the consensus seems to be that this was really the best we could possibly hope for, despite not (yet) being quite enough to save the planet. If you missed it, SPN had some of the foremost experts discuss the UN’s recently adopted Sustainable Development Goals (SDGs) and the effects of climate change on women in developing countries, a critical point of contention in the lead-up to the Paris agreement. We also had a fascinating conversation with experts in architecture and forestry about the ecological benefits of building with wood. It turns out—obvious once you think about it—that wooden structures are carbon sinks, and sustainable forest management are important in decreasing carbon emissions. The timely conversations about the SDGs (AKA the Global Goals) and the impacts of climate change on women in developing countries were most informative. We learned from MasterCard and SABMiller that the development of the SDGs was an exceptionally consultative process that for the first time engaged industry, balancing those perspectives with global development and sustainability goals. This process helped to create the most comprehensive and ambitious set of development goals to date. The goals number 17, a few more than the preceding MDGs, and together aim to achieve three overarching objectives: ending extreme poverty, fight inequality and injustice, and fix climate change. Tools have been created to simplify business contributions to the goals, such as the game-changing SDG Compass, developed jointly by the UN Global Compact, GRI, and the World Business Council on Sustainable Development (WBCSD). It helps businesses to enhance their core business activities while directing them toward reaching the goals. Read more about it here. Finally, and this was borne out in Paris, the impacts of climate change on women in developing countries is getting the attention it deserves as a keystone of climate change solutions. Facebook dove headfirst into the climate movement, creating a "Love Earth" page to share content during the Paris conference and promote a picture switch campaign (which wasn’t as successful as past campaigns) but nonetheless pushed a lot of beautiful content to an audience of about a half-million. Decentralized renewable energy production seems to be the agreed-upon solution to both sustainable development and climate change, which makes it an unlikely tool for women’s empowerment. Governments and civil society have a responsibility to engage women worldwide in climate solutions. At the same time, national climate policies are sorely lacking, especially in the United States, which is the largest emitter historically, the richest country in the world, and which has one of, if not the largest climate denial party in control of its legislative bodies. Now more than ever we need to expand the sustainability movement to put this historic plan into fast action – and to hold our leaders accountable to the Paris promise. It is often thought that the genders are unequal elsewhere in the world, such as in the societies of the Middle East, Africa, and the Far East. However, gender inequality remains a pervasive problem, here in the United States. The World Economic Forum ranked the U.S. at number 65 out of 142 countries in the category of wage equality for similar work. Particularly troubling is the fact that the United States has not ratified the Convention on the Elimination of Discrimination Against Women (CEDAW), a landmark international agreement signed by over 180 countries that affirms fundamental human rights and equality for women around the world. The CEDAW was originally signed by President Jimmy Carter back in 1980, but our senate has not bothered to take a vote in the 35 years since. Only six other countries have failed to ratify the CEDAW: Iran, Somalia, Sudan, South Sudan, Palau, and Tonga. Recently, media mogul and thought leader Arianna Huffington called for a third women's revolution, noting that the first revolution won women the right of suffrage and the second, while not yet complete, has begun to put women in positions of power in governments and companies around the world. The third revolution is rooted in the idea that it's not only the gender breakdown of those in leadership roles, but also the way leadership is conducted. Traditionally, leadership is an always-on, all-or-nothing, zero-sum game of plowing through task after task, day after day. Men boasting of near-constant productivity and many sleepless nights is a hallmark of male-dominated leadership. But for true productivity, Huffington notes, relaxation, disconnection from our devices, personal time–and yes, sleep–are under-utilized tools for productivity enhancement, not to mention personal growth and community building. This is not just about taking on more leadership roles, but about changing the way the world works, slowing down, having more recharge time, and thinking more holistically and sustainably. Women, she contends, are the ones with the experience and the empathy to help all of us –men and women – transition to this more balanced way of life. Developing a more sustainable and healthful world for future generations requires a greater reverence, appreciation and leadership role for the character and qualities inherent in womankind . Climate change is happening–and it’s here to stay. Fourteen of the fifteen warmest years on record have occurred since 2000–and the fifteenth was 1998. Month-to-month and year-to-year variations are to be expected of course, but decade by decade the pattern is a clear and startling warming trend, and its resultant impacts on biodiversity, food systems, water supplies, and national and global security cannot be understated. In New York, we know all too well what rising seas can mean for our way of life; many communities are still rebuilding from Hurricane Sandy over two years later. Since Mayor de Blasio was elected one year ago, however, it seemed his agenda was focused on affordable housing, universal pre-K, reform of the NYPD's stop-and-frisk policy, and reducing traffic fatalities. But one glaring issue loomed with little mention; an issue considered by many New Yorkers, including the previous mayor, to be one of the most important facing the city. This is not to say these issues are not also important. The threat posed by inequality in particular might be said to be equally as important as that of climate change. Middle-income people, many of the "creative class," who have for decades built communities in New York, are being priced out of living here (Manhattan especially). They don't want to leave, but their options are dwindling. A diverse population, vibrant cultures, and resilient neighborhoods are all at stake when speculative investment drives up real estate prices, rents, and property taxes for residents and businesses. That said, the Tale of Two Cities was never more evident than in the days and nights following Sandy. Both issues threaten to bifurcate and cripple the nation's greatest city, so it seemed unwise not to address them with equal zeal. At the end of de Blasio's first year, however, it is clear that a shift is taking place. De Blasio's office recently announced a new Office of Sustainability with the impressively credentialed Nilda Mesa at the helm. He also unveiled an ambitious plan to reduce greenhouse gas emissions by 80% by 2050, starting with a plan to retrofit the city's building stock for energy efficiency and livability. He followed that up with a climate resiliency plan for the city's infrastructure. SPN's recent panel discussion focused on the one-year mark of de Blasio's time in office, and noted both the focus on inequality and the recent pivot toward climate change… Check the featured content section for more on de Blasio’s attention to sustainability issues. Email communications@sustainabilitypractice.net with news or info! 2014 was a year of progress and promise for sustainability, giving us much to look forward to in 2015. We’d like to remind you of where we’ve been. 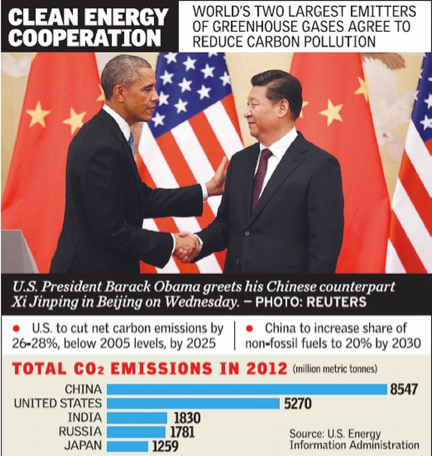 First, we saw a historic deal reached between the United States and China to reduce CO2 emissions. The two countries—the two largest CO2 emitters—for the first time agreed to clear targets for curbing carbon emissions over the next fifteen years. We also saw the UN Intergovernmental Panel on Climate Change release its Fifth Assessment Report, which concluded that global warming is unequivocal, humans have a clear influence, and the longer we wait to mitigate it, the more expensive it will become. While this wasn’t news to most of us, it presents an important milestone that will influence decision makers worldwide ahead of the next Conference on Climate Change, which takes place in Paris later this year. These developments represent significant momentum toward addressing environmental and social challenges. And that’s where we ought to keep the focus moving forward. SPN’s next discussion panel, taking place February 24th at NYU’s Stern School, will assess Mayor Bill de Blasio’s accomplishments during his first year in office as compared to the promise of his campaign. Panels in March and April will examine the effects of climate change on women in developing countries and the persisting gender gap in the United States, respectively. What are you most looking forward to in 2015? Let us know in the comments below. Welcome to the Sustainability Practice Network’s new Blog! We invite you to subscribe to our blog, where we’ll be writing about recent events and developments in sustainability. SPN held its most recent panel discussion ‘Clean Tech 2014: Incentives for Innovation’ last week with experts in the fields of energy, finance, agriculture, and public policy. Hosted by Bard College’s MBA in Sustainability, the panel featured speakers David Gilford, Vice President of the NYC Economic Development Corporation, Morris Cox, Chief Investment Officer of BlocPower, Jun Shimada, Founder and CEO of ThinkEco, and Rob Leclerc, Founder and CEO of AgFunder, who provided a diverse cross-section of industries and perspectives on where Clean tech is now –– and where it is headed. SPN monthly panels feature fresh perspectives about the complex issues facing the world today. Visit the Featured Content section to read more on the latest in clean tech! Read more about Welcome to the Sustainability Practice Network’s new Blog!